Hydrotex ™ fabric-formed Concrete Erosion Control and Armoring Systems outperform rip rap and concrete slope paving, yet are less expensive and far easier to install. Hydrotex™ Fabric Formed Concrete Systems have been installed worldwide in severe hydraulic, geotechnical and environmental conditions. They have outperformed more traditional methods in erosion, scour and containment protection, proving our Fabric Formed Concrete Systems are superior to rip-rap, concrete slope paving, gabions and precast concrete blocks. Hydrotex fabric formed concrete linings are less expensive than stone rip rap or slope paving and perform better. Hydrotex Linings supply the stability needed to resist the stresses from Hurricane Storms high velocity flow. Hydrotex fabric formed concrete linings offer better hydraulic efficiency over older systems such as rip-rap, gabions, precast blocks, and conventional concrete slope paving. 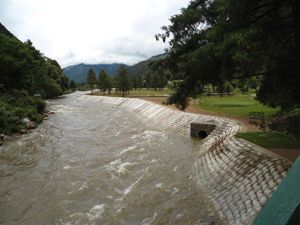 Our Hydrotex Fabric Formed Concrete Systems reduce uplift forces due to outflow and excess pore water pressure, mitigate hydraulic uplift by reducing channel velocities, and shape to soil profiles thus mitigating the potential for scour. Concrete for Hydrotex fabric forms is pumped in-situ, making delivery more cost effective and installation easier, requiring minimal manpower. Hydrotex systems are not only less expensive than either rip rap or conventionally-formed concrete slope paving, they are also more efficient. Thus a more cost-effective erosion control system with higher hydraulic efficiency, improved stability, durability, and performance against Hurricane Storms. Made of high strength, GeoTextile woven fabrics, Hydrotex fabric forms are engineered to match various project parameters. Clients can specify different forms to fit their specific site conditions. Hydrotex linings and mats control erosion and scour, and are used for ditch linings to coastal revetments. Hydrocast™ Armor Units are used for higher forces such as Hurricane Storm Protection weather, strong wave action. Once pumped with concrete, these mattresses become a single monolithic structures suitable for construction of seawalls or for the repair of extensive scouring of bridge piers. Hydrotex products have been extensively tested and proven. Flume testing of Hydrotex linings and mats has derived precise design values to assist you in selecting the appropriate fabric form style and mass per unit area to resist the expected hydraulic loading.